Highly load-resistant, continuous fibre-reinforced and functional plastic parts have enormous potential not only for the automotive and aviation industries. For this reason, the Institute of Plastics Processing (IKV) in Industry and the Skilled Crafts at RWTH Aachen University is examining possibilities for the economical production of FRP parts with a thermoset matrix by the injection moulding process. The mounting demand for plastic parts reinforced with continuous fibres is based on their high mechanical strength with up to 25 percent less weight compared with metal parts. For this reason, their production and in particular the economic benefits of the process and the reduction of production steps with short cycle times have been the subject of various research projects. Whereas FRP parts with a thermoplastic matrix are already being produced on an industrial scale and are in widespread use, IKV is now occupied for the first time with the production of continuous fibre-reinforced lightweight parts with a thermoset matrix. Because of their better low-temperature resistance and higher mechanical and thermal load resistance, thermosets are superior to thermoplastics in many applications. In the present research project, the IKV team is examining the possibilities for producing lightweight parts with a thermoset matrix. Similar to the already known process involving the integrated moulding and back-injection of thermoplastic FRP, the aim is thus to combine the favourable lightweight properties with the greater part complexity that is possible with injection moulding, and apply this to thermoset parts, too. Two innovative process routes are used: a two-step process route involving the backmoulding of parts previously produced in the established RTM process, and a single-step route involving the backmoulding of towpreg/prepreg materials, which, integrated into the process, cure in the injection moulding process. Both methods have the advantage of a reduced number of production steps compared with conventional functionalisation strategies such as bonding or riveting, and of shorter cycle times. 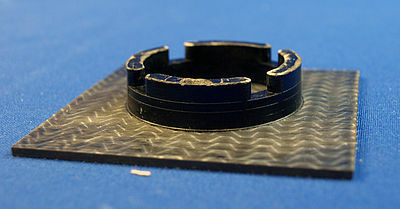 The attained research results such as process parameters, attainable part complexity, adhesion/bonding properties and the technological and economic evaluation can help in future to increase not only the complexity of the component but also the functional integration, and thus tap new fields of application for thermoset FRP parts. The research project IGF 9EWN is financed by the AiF as part of the program of the Federal German Ministry for Economic Affairs and Energy for funding Joint Industrial Research (IGF), based on a resolution by the German Bundestag.